In 1984, Jaime and Elvira moved to a small space in East Austin and borrowed machinery to start their own tortilla factory. Their mission was simple, yet ahead of its time - produce 5-ingredient flour tortillas without additives or preservatives. 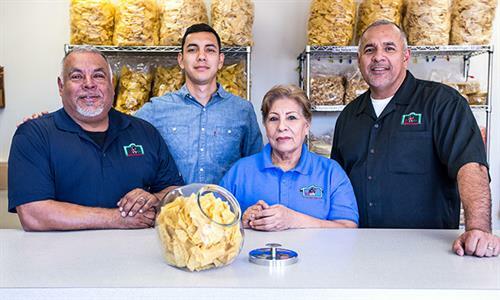 The couple delivered fresh, warm, soft tortillas to grocery stores nearly every day, which eliminated the need for extended shelf life.Fiesta Tortillas expanded and grew over the years alongside the Picos family with the addition of Alvaro, Luis and Natalia. Jaime’s parents moved to Austin and joined the team. While other Austin tortilla factories failed, Fiesta Tortillas continues the thrive. With over 100 employees, Jaime personally greets his staff everyday and continues to put family first. Three generations of Picos members work alongside each other - continuing to build community - one tortilla at a time. Take Burleson exit, off of Ben White, turn right onto Promontory Point Dr and it will be the first building on the right.